Fans have had a quarter of a century to see Boyzone live in concert. But after this year’s farewell tour and their last ever studio album, ‘Thank You & Good Night’, it will be time to say au revoir to Ireland’s sweethearts. Ronan Keating, Shane Lynch, Mikey Graham and Keith Duffy — with the help of late band member Stephen Gately, through a reworked track — began to bid their fans farewell in 2018, when they announced that their seventh album would be their last. But with such a loyal fan base, why not just let Boyzone go on forever? “We want to be in control of our final chapter. We don’t feel we can ever do better than what we’ve done on this recent album, ‘Thank You & Goodnight’. We’ve given 110 per cent on this tour... We’d rather write our own chapter, finish on a high, go out on top and be proud of the career that we’ve had,” Duffy said, speaking to Gulf News tabloid! ahead of their April 12 concert at the Dubai Duty Free Tennis Stadium. According to Duffy, Boyzone have so far on this tour sold out everything from the O2 and Wembley Stadium in London, to The Echo in Liverpool and the 3Arena in Dublin. Audiences have been a mixed bag, from as young as five years old. “There was a lady there the other night that was 89 years of age. We’ve got a huge amount of men in the audience now, whether they’ve been dragged along by their girlfriends or their wives or whether they’re actually going because they like our music, I’m not sure,” said Duffy. “It’s just unbelievable. It’s the first time in over five years that we’ve done a concert tour... If somebody had told us back in 1993 and 1994 that we’d still be playing arenas in 2019, we never would have believed them,” he added. ‘Thank You & Goodnight’ was a different affair than any of the six albums before it. With each member having a different musical inclination, they decided to each pick three songs that would make the final 12-track record. But most special of all is the final song on the album, ‘Dream’. It features the vocals of Gately, the band’s fifth member, who died 10 years ago after an undiagnosed heart condition. Gately wrote and recorded the first rendition of ‘Dream’ 18 years ago. He would have celebrated his 43rd birthday last month. “Stephen was a great character — he was very colourful and he always liked to get the last word in. And here we are, the final album, Thank You & Goodnight, and yet again, Stephen Gately, God rest him, he gets the last word in, which is brilliant,” said Duffy. Despite years of international success, Boyzone had no idea what was in store for them at the start of their career. They hit their first No 1 in the UK — and No 2 in America — with the single ‘Words’ in 1996. They achieved the same UK-American smash hit only one other time in their career, with ‘No Matter What’ two years later. “Back when we started in the early ‘90s, we didn’t really know how successful we were going to become — we were kind of just a working band, singing three or four songs in a nightclub on a Friday or Saturday night. Eventually the success grew and we started doing small venues, like church halls and the odd city theatre, and then it grew again and we ended up playing in big arenas and some stadiums around the world,” said Duffy. Now, near the end of the group’s journey, he finds it difficult to pick out a single moment he would like to relive. “To name a few, getting to perform in Modena [Italy] with Poveratti was just unbelievable. Performing with U2 in the ‘Sweetest Thing’ video, that was a really big moment for me, because I’m a huge U2 fan. Getting to play the likes of the Royal Albert Hall, performing for Andrew Lloyd Webber’s 50th birthday party. Getting to meet some of our heroes in the music business over the years — and meeting them on a par, meeting them on a level and shaking their hands. We’ve just been absolutely spoiled rotten by the success of this business,” admitted Duffy. The band went on a hiatus between 2001-2007, but learnt a few valuable lessons on pulling together a successful reunion. “A huge part of the success of Boyzone is that we listen to each other. We understand each other. We know the buttons to press to upset each other and we know the buttons to press to keep each other happy, so it’s about trying to live a harmonious life, bring out the best of people, be the best version of yourself and try and be generous, not selfish,” said Duffy. Describing the band’s final tour, Duffy said it’s “basically a trip down memory lane,” with a set list that features all the hits, from ‘Love Me for a Reason’, ‘Picture of You’ and ‘Going Gets Tough’, to new material — including the 2018 single ‘Because’, co-written by Ed Sheeran. “We’ve got massive big LED screens behind us showing the early footage of Boyzone while we’re performing the old hits. It’s a big, big show, over two hours long,” said Duffy. But the post-Boyzone future looks bright for the individual band members, who have never been known to keep idle. “Shane at the moment is recording different car shows for the National Geographic Channel — he’s building race cars and that’s what he loves to do. Ronan will probably be going back into the studio and possibly recording another solo album. Mikey is in the studio writing with new producers and new writers all the time. Myself and Brian McFadden, who created [Boyzone and Westlife supergroup] Boyzlife about three or four years ago, we’re back on the road — we’re recording a new album in May,” said Duffy. For now, they’re all focused on one thing: living in the moment and soaking up this final chapter together. “We’re feeling very nostalgic, we’re very emotional… It’s a real bittersweet experience, but we’re trying our best to just stay excited. We’re trying our best just to enjoy every show. And when it comes to that last show, somewhere near the end of the year, that’s probably when we’ll all break down and cry,” said Duffy. 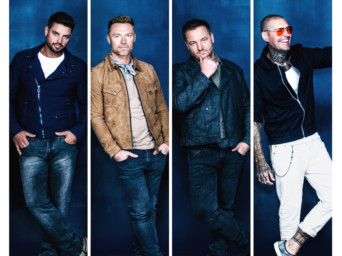 Tickets to see Boyzone at the Dubai Duty Free Tennis Stadium on April 12 cost Dh195 and are available online.